Often called the Grand Dame of British fashion Dame Vivienne Westwood’s name is synonymous with punk, rebellion and subversive British fashion, Born in Derbyshire in 1941, Westwood has become one of the most loved style icons in British fashion history. Starting her design career in 1971 at 430 Kings Road, her design career has been a tale of true British style, eccentricity and rebellion. Twice British designer of the year and still a rebel with many causes including recently donating 1 million pounds to help stop climate change, Dame Vivienne is one of the most influential and original designers of our time. If you are looking for something with depth and meaning and not just fashion and style, you will love all of the Vivienne Westwood lines that we stock at POUR TOUS by Davidson & Beaumont. In 1989, Andres Kronthaler came to London where he worked with Vivienne Westwood on her collection. Since then, Kronthaler stayed on with Vivienne Westwood where his role progressed and grew, collaborating and working with Westwood to develop subsequent collections. Kronthaler and Westwood got married in 1993. Over the years, Kronthaler has chosen to be a silent partner, preferring to take a less public role but their partnership is nevertheless one of fashion’s most formidable. While Westwood was unconventional and challenging, Kronthaler was driven by quality and progress. Together, they were able to stimulate, support and encourage one another. 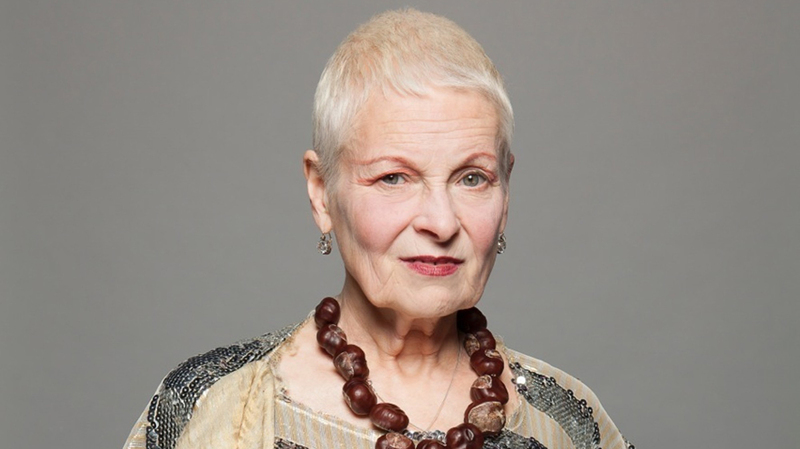 Recently Westwood officially renamed her Gold Label as “Andreas Kronthaler for Vivienne Westwood.” The line is now in honor of the designer’s longtime design partner and husband. Launched in 1997 and made from the Westwood archive, Anglomania’s contemporary draping has become a brand signature as have the constant references back to the 70s, 80s and punk movements, all undertaken with a casual edge and feminine appeal. A Vivienne Westwood Anglomania design is like a piece of fashion history. A collection of future classics, each piece will endure. The Grand Dames Mens line launched in 1996 and is now co designed with husband Andreas Kronthaler. Classic tailoring and iconic styles such as the high collar shirt and ‘drunk’ cut trouser sitting alongside Westwood’s continued experiments with cut and pattern, beautiful knits and fantastic tees. Vivienne Westwood likes to have fun with her design and her bags and jewellery are no exception. Whether you’re buying into the luxe or the more tongue-in-cheek, a Vivienne Westwood accessory will really complete your look whether it’s signature skulls, tartan,orb stamped totes or an iconic armour ring.